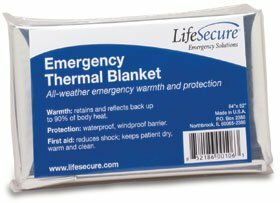 Emergency Thermal Blankets supply essential warmth and protection from the elements in all weather conditions. Special waterproof, windproof material provides a barrier from the elements. When fully wrapped around the body (best when in fetal position), the blankets retain and reflect back up to 90% of body heat. Blankets deploy to 84" x 52", providing ample coverage for most adults. These all-weather thermal blankets are compact and lightweight, making them easy to store in any emergency kit or travel with. For first aid, these blankets can be used to help reduce shock by keeping patients warm, dry and clean. Dimensions: 8" x 8" x 12" folded • 84" x 52" unfolded • Weight: 3-3/4 lbs.